Are you ready to run the show behind the screens as a Web Developer? 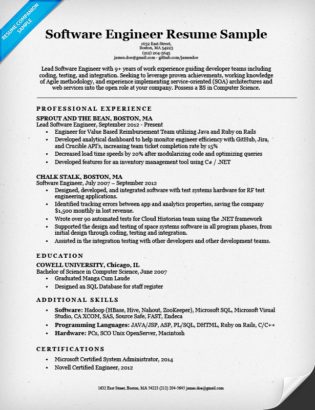 Land the perfect position with this web developer resume example and customized writing tips. However, if you don’t have the time to make a resume from scratch, save yourself a headache by using our fast and effective resume builder. Need some help for your cover letter, too? Visit our collection of winning cover letter samples for the best tips and tricks. Innovative Web Developer with 5+ years of experience in website design, adaptation, and maintenance. Seeking to use extensive knowledge and background in front- and back-end web development to advance and optimize the online presence of ABC Inc. 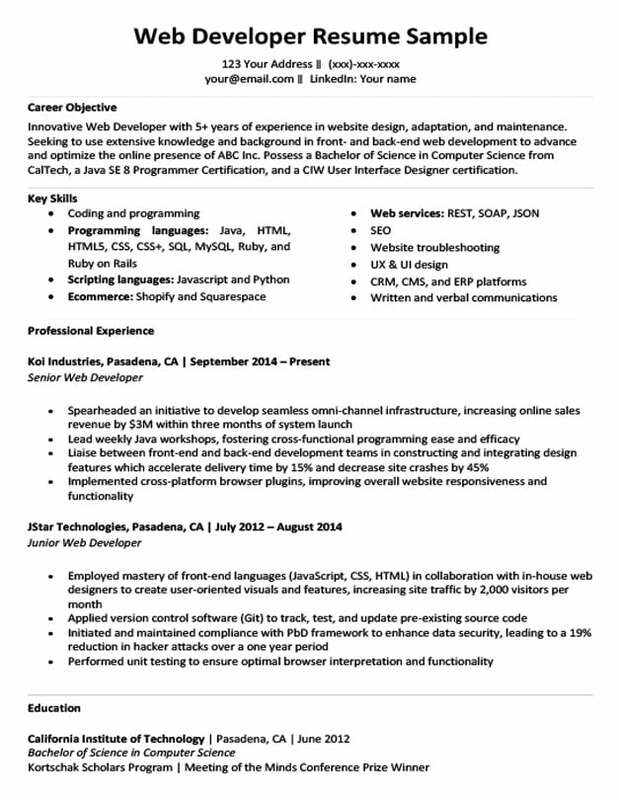 Possess a Bachelor of Science in Computer Science from CalTech, a Java SE 8 Programmer Certification, and a CIW User Interface Designer certification. Land the perfect position with the five expert tips below! While many candidates choose to skip the career objective in favor of jumping into their Skills and Professional Experience, set yourself apart by leading with this three-sentence introduction into who you are and why the hiring manager should keep reading. IT is a broad and dynamic field that is constantly evolving as technology progresses. Every position that needs to be filled requires a unique candidate to meet a specific set of goals. In order to convince a prospective employer that YOU are the right person to tackle those goals, ask yourself: What kind of web developer am I? Let’s explore how including each of these components effectively will have any hiring manager hooked in just three sentences. Start off by stating your professional title and years of relevant experience. Allow this line extra impact by including an applicable adjective to your title and by adding a detail or two to describe your experience. Innovative Web Developer with 5+ years of experience in website design, adaptation, and maintenance. In the example above, the applicant leads with the adjective innovative, states their job title, and specifies their years of experience in website design, adaptation, and maintenance. Although this sentence is compact, it is specific and effective. The next point that needs to be addressed is how you plan to contribute to the company and what qualifications you will use to make this contribution. Seeking to use extensive knowledge and background in front- and back-end web development to advance and optimize the online presence of ABC Inc. While thinking about what to write here, it’s a good idea to consult the job listing. What exactly does the company need from you, and what makes you best able to meet those needs? Check out the company’s website to gauge their key values and ambitions. Align these with your own to emphasize your suitability for the job. Finally, the last piece of your career objective should broadcast your educational background and relevant training/certifications. Possess a Bachelor of Science in Computer Science from CalTech, a Java SE 8 Programmer Certification, and a CIW User Interface Designer certification. Once again, this sentence is succinct but has potential for high impact if tailored to the position. Don’t bury your most notable qualifications in a long list of certificates. Instead, choose one or two documented specializations that are best able to impress your target audience. If you want more advice on crafting the perfect career objective, check out this step-by-step guide to making those first three sentences pack a punch. Humans are visual creatures. Be conscientious of not only what information you present on your resume, but how you present it. Notice in the example above how the Skills section comes before the Professional Experience section. As web development is a technically-rich career, the Skills section holds a lot of weight. Build by relevance — first outline the multiple systems and languages you know how to use, and then detail how you’ve used them in previous positions. Maximize effectiveness by using a format that allows you to pack in all your skills while maintaining readability. 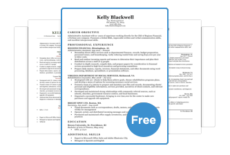 Finding the format to meet your needs is easy with our selection of free, downloadable resume templates. Speaking of the ever-important Skills section, don’t overlook the value of including your aptitude for written and verbal communication. While technical proficiencies will rule your resume, the same can likely be said for your competing applicants. Prove your unique value by demonstrating your ability to communicate with clients and colleagues. Show how you’re capable of collaboratively assessing and adapting a vision with a team, and you’ll immediately make yourself a more competitive candidate. While communication is key, there are a variety of attributes that can be used to demonstrate a comprehensive skill set. Check out this Skills section writing guide, including a detailed list of soft skills for ideas on supplementary attributes worth adding. After constructing the perfect Skills section as outlined above, you need to segue into how you’ve used those abilities to the benefit of your company or client. Draw a clear line between your listed skills and your professional experience by expressing how you applied an area of know-how to a task. It is important to draw these links in order to both reiterate your skill set and to advertise your capacity to put them into practice. Spend some extra time refining this portion of your resume. Check out these tips and suggestions for composing winning Professional Experience bullet points. What’s the most common way to measure the success or failure of a business endeavor? Even if you don’t consider yourself on the front lines of profit-generating, your efforts at a company likely contributed to a measurable growth in revenue at some point. Direct your Professional Experience bullet points toward these efforts and their respective effect. While you should include multiple quantifiable achievements in this section, don’t neglect to include at least one that ends in financial gains. A company wants to know if you are worth hiring. Don’t leave a doubt in their mind by showing exactly how profitable adding you to their team can be. Ready to land that job? Take advantage of our large number of free downloadable templates. 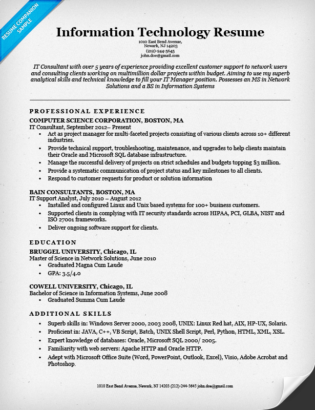 If you’d rather build the perfect resume in minutes, just use our customizable generator.